Iran has halted to its oil sales to Britain and France on Sunday - European Union enraged Tehran last month when it decided to impose a boycott on its oil from July 1. 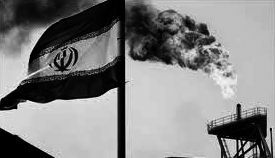 Iran, the world's fifth-largest oil exporter, responded by threatening to close the Strait of Hormuz, the main Gulf oil shipping lane. On Sunday, its oil ministry went a step further, announcing Iran has now stopped selling oil to France and Britain altogether - a powerful yet largely symbolic message since neither European nation relies on Iranian crude imports.